Working as a timber cutter his entire life, Doug Adamson spoke fluent tree. His work saw him travel far and wide in such places as Tamborine Mountain, Springbrook and Birrell Creek in Northern New South Wales. In 1950, Doug first stepped foot in the Woodchopping arena at the age of 18. From here he began his competitive career which spanned over 40 years. Throughout this time, Doug travelled extensively throughout Australia and overseas competing where he could. Doug retired from competitive Woodchopping in 1996. Doug was an all-round axeman, competing in all aspects of the sport, Tree Felling, Standing Block, Underhand and Sawing. However Tree Felling was recognised as Doug’s strong suit winning most Tree Felling events he entered. Throughout his woodchopping career, Doug’s achievements are numerous and vast. Some of his most memorable achievements are winning a Tree Felling Handicap at Brisbane Show in 1956 with a prize of £90.00. 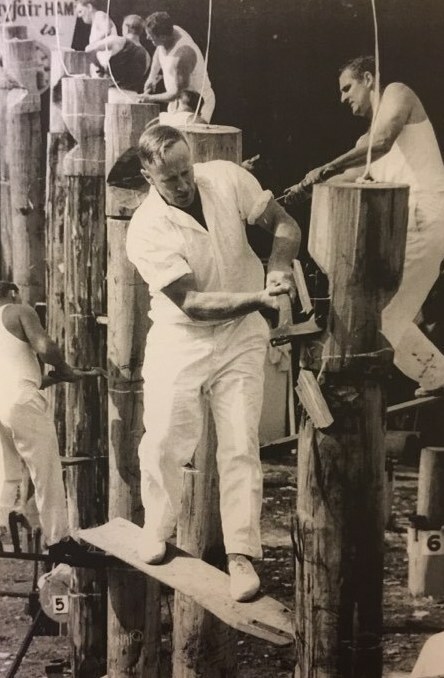 Another was being one of a select few chosen to demonstrate the sport of Woodchopping to Her Majesty the Queen Mother, Her Majesty the Queen Elizabeth II and the Duke of Edinburgh in 1963 at the Brisbane Show Grounds. Another was been chosen to represent Queensland in the 1970 World Series in Tasmania, as well as represent Australia at the 1972 Narobi Show in South Africa. Another memorable achievement was being one of the founders of the Brunswick Heads Fish and Chips Carnival, which he was adamant in attending each year. He competitively competed at the ‘Fish and Chip’ Carnival for over 30 years and was a steward for over 10 years. Doug’s love of the sport was shown by the numerous time he spent analysing and preparing woodchopping blocks for various shows. Additionally, Doug organised and ensured the smooth running of carnivals. 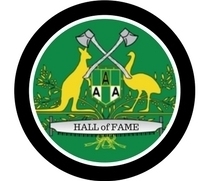 The Queensland Axemen’s Association showed their appreciation of Doug’s love and contribution to the sport of Woodchopping by awarding him an Honorary Life Membership of the QAA in 1972. The Adamson name is still well known in the chopping arena as his sons Gary and Bruce and grandson Joshua shared the love for the sport and followed suit. Gary and Joshua are still competing today.